Would you listen to a man with this haircut? 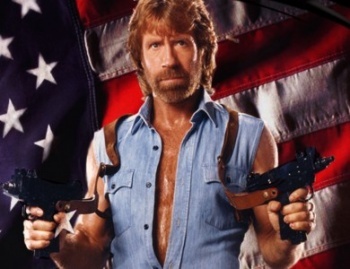 Walker, Texas Ranger Chuck Norris is internet-famous for being a badass unstoppable mofo, but it turns out that he’s also kind of a douche. Norris is speaking out today against, um…tolerance, and compares gays and those seeking equality to cultists. “What happens when the political and public educational pendulum swings from concern for the tyranny of sectarianism in Jefferson’s day to secularism in ours? What happens when U.S. public schools become progressive indoctrination camps? Dr. Jim Nelson Black, founder and senior policy analyst of the Sentinel Research Associates in Washington, D.C., wrote an excellent book, “Freefall of the American University.” In it, he documents the clear biases pervading our public academic settings. Among that lopsidedness is the intentional training of students to disdain America, freely experiment sexually, forcefully defend issues like abortion and homosexuality, as well as become cultural advocates for political correctness, relativism, globalization, green agendas and tolerance for all. One of the primary ways these educative platforms are spread is by recruiting and retaining faculty members who reflect and teach them. Indoctrination camps? Isn’t that the same argument that the Ugandan’s are using to justify their Kill The Gays Bill? Tread carefully, Norris. It’s sounding like you’ve taken one too many jumpkick’s to the skull. And is he seriously arguing that students are complaining that equality is hindering their education? Universities in America are perhaps the most tolerant places in the country. Young people simply don’t care about the sexuality of their classmates in overwhelming numbers. Norris is either misinformed or lying. Tolerance, I suppose, is generally bad for business in Norris’ eyes. Would a world where people all got along and respected one another have need for washed up Kung Fu action stars? Who cares knows? Who would win in a fight: Chuck Norris or the entire gay population of the world? Ding!